British Academy Small Research Grant Awarded: June 2010. Project Team: Dr Kathryn A Burnett; Mr Ray Burnett. This (British Academy) small grant funded project is now complete in respect of the archive data sourcing, collection and preliminary analysis. Related research exchange and dissemination have already taken place and a number of other activities and outputs are under development for late 2013 – the year of the 50th anniversary of the Tristan islanders return in 1963. It is hoped that continued research activity will emerge from this small grant project. Communication Association Glasgow 2013. In addition, several illustrated talks and lectures have been given as part of our knowledge exchange and cultural brokerage remit most especially with island communities. 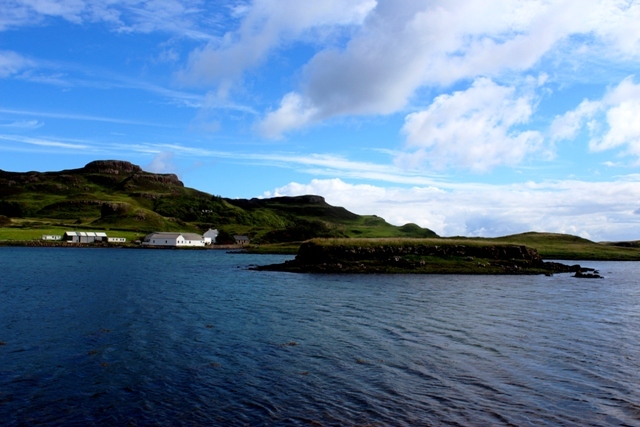 In particular invited talks have been given as part of the Shetland Museum and Archive 2013 programme, and in August an illustrated talk on the island of Canna as part of Feis Cannaidh 2013 (image shows Canna Farm and St Joseph’s Church). An interview by the research team was given to BBC Shetland in March 2013 on the project and its findings in relation to the Shetland dimension of the Tristan evacuation in 1961. Field sites for archive research of both government files, newspapers film.sound archive, as well as personal paper collections have been undertaken in a range of institutions and sites including Southampton, Shetland Archives, Canna House – National Trust Scotland, as well as the National Library Scotland, Glasgow’s Mitchell Library, British Library at Collingdale and Sweden’s National Library – Kungliga biblioteket, Stockholm. November 2013 is the 50th anniversary commemoration of the return of the islanders as a community to Tristan da Cunha in 1963. The Scottish Centre for Island Studies is hosting a one day research and knowledge exchange event in Glasgow in honour of the islanders’ successful return and resettlement in 1963. More details of this event can be found by clicking this link.